Alright, I got a little camera happy when I saw the jet coming in. 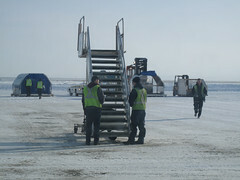 The jet is scheduled to come into Bethel 3 times a day. But theses flights have been canceled a lot due to weather. Many of the folks on this plane flew to Bethel last night and when it started to snow hard the jet turned around. They were only 10 miles from Bethel, bummer. 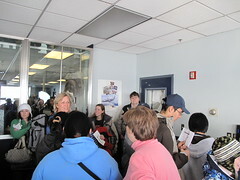 The airport (hangar) was standing room only as they packed all of the passengers in Bethel past security. Many of the folks in Bethel had been trying to get out last night too. 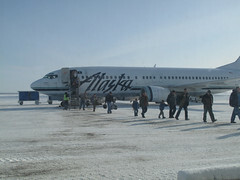 When the last flight comes in, they pack up the passengers and “turn and burn” back to Anchorage. We were lucky to schedule a flight on a good day. 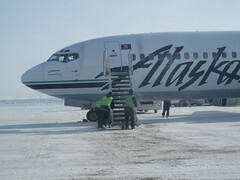 So we are off to Fairbanks for my spring break. Tom is completing manager training at Fort Wainright. It will be good to get out for a while together.